When the town fathers chose to dub this Central Valley community the "City of Action" they probably weren't thinking of railfans. 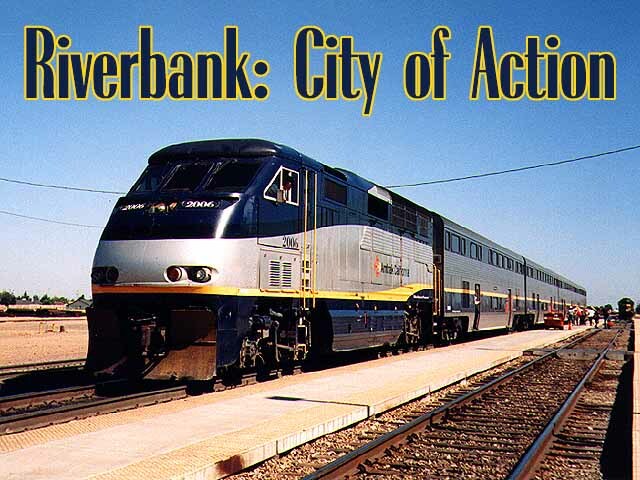 But Riverbank's official slogan might as well apply to BNSF's Riverbank yard, which doubles as a minor car classification facility and passenger terminal. Fans of older-model diesel locomotives are likely to find them here, "kicking" cars in the yard. But you will find plenty of BNSF's current horsepower on display as well. Intermodal trains are regular customers here, as are Amtrak's San Joaquin passenger trains. Because Riverbank serves as the junction for the Riverbank Subdivision that connects nearby Oakdale, you will also see occasional Union Pacific trackage rights trains. Riverbank's passenger station is quite small, and as of this writing construction is underway on a much larger, modernized station in neighboring Modesto. When the new facility opens, Amtrak will divert its trains to the nearby Union Pacific tracks and Riverbank will become just another obscure stop for freight traffic on the Stockton Subdivision. BNSF 3197, a GP50 , and ATSF 6385 , a B23-7, kick cars in the Riverbank Yard on Jan. 18, 1999. B23's are pretty rare these days, but this scene is typical of Riverbank and other yards where former Santa Fe workhorses have been relegated to switching chores. Photo by Roni Gehlke. Rocky lives! No, not the heroic boxer made popular by Sly Stallone, but the mountain goat that became the familiar icon of the Great Northern railway. There's no mistaking those sky blue high-side gondolas, but they sure do look out of place in California in 1999, especially considering that the Great Northern was sucked up by BNSF's predecessor, the Burlington Northern, in 1970. These cars are being used to haul old railroad ties, which are being loaded by the crane at right. Photo by Roni Gehlke. AMTK 2006 leads a westbound San Joaquin train during a station stop on June 21, 1998. We have immortalized Riverbank's famous slogan on this homemade postcard. Photo by Roni Gehlke. 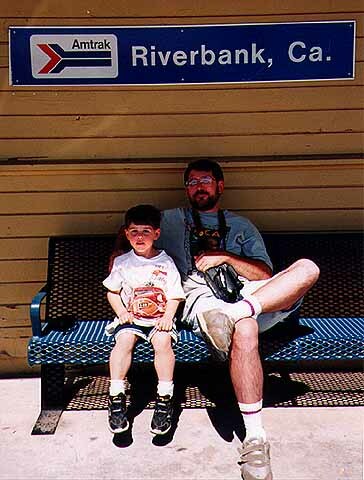 Glenn and Benji pose for a photo on a metal bench located beneath the station sign mounted outside the Riverbank depot. This classic wood-siding station is still used as an office for BNSF train crews. Its days as a passenger facility are numbered, unfortunately. Photo by Roni Gehlke. This page was last updated Monday, March 29, 1999 at 23:35 hrs.